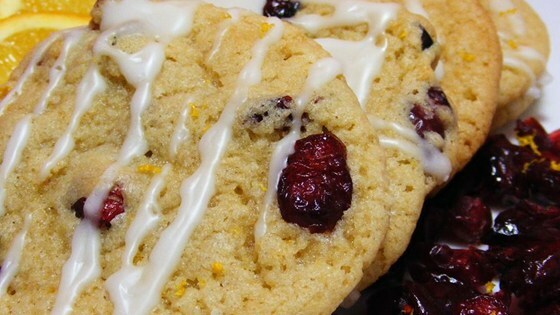 A delicious orange cookie with dried cranberries. Beautiful and tasty! 60 calories per cookie. Preheat oven to 375 degrees F(190 degrees C). Lightly grease cookie sheets, or line with parchment paper. In a medium bowl, cream together the white sugar, brown sugar, and butter. Stir in the egg, orange juice, orange extract, and orange zest. Sift together the flour, baking powder, baking soda, and salt; mix into the orange mixture. Stir in the dried cranberries. Drop cookie dough by heaping teaspoonfuls, 2 inches apart, on the prepared cookie sheets. Bake for 10 to 12 minutes, or until edges are starting to brown. Cool on baking sheets for 5 minutes, then remove to a wire rack to cool completely.